2015 in review. 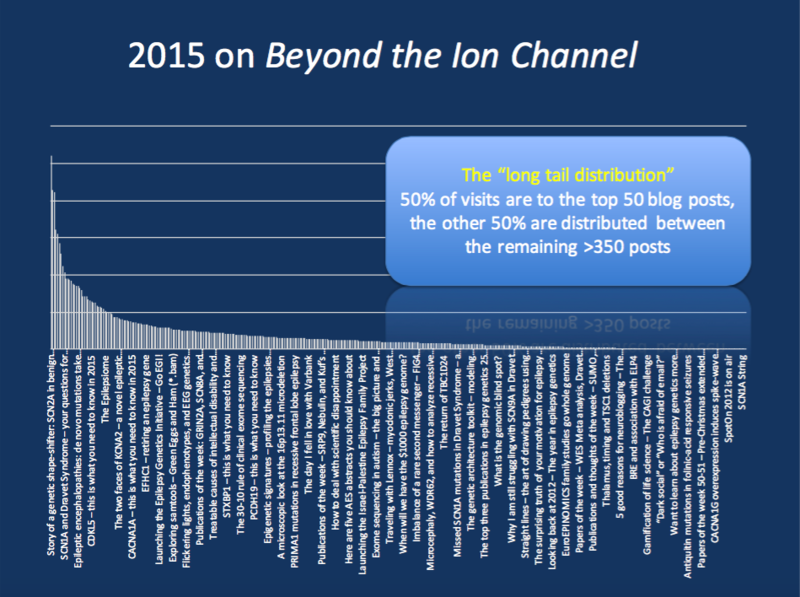 This year has been a very busy year on Beyond the Ion Channel and this is my time to thank our contributors and readers. This blog and the Epilepsiome project have become an essential part of what I am doing. I am very thankful for all the feedback and advice that I have received this year. We have also finally launched the Epilepsiome project this year, the gene curation project of our epilepsy genetics community. As a summary of 2015, we have put together a summary of the most popular posts of 2015. Overall, the visits on our blog this year follow the “long tail” distribution that we commented on in an earlier post two years ago. Basically, there are popular and not-so-popular posts, but the “heavy hitters” don’t overshadow the less popular post as much as you might expect from the Pareto Principle. The reason why I am mentioning this is that this is a good reminder and motivator to have diverse content on our blog. Basically, even though there are some very prominent topics that people consult our blog for, all genes and all topics matter. 2015 regrets. There are a few things that we didn’t get to write about this year. Due to time constraints, we weren’t able to put together a post for AES in Philadelphia this year. Also, there were quite a few Friday emails that didn’t get sent and there are at least 5 Epilepsiome genes that haven’t been transferred yet to our static webpage yet. In 2016, we will try to do better by making sure that we improve the format of our Epilepsiome project. 1 – SCN1A. We had several posts on SCN1A this year including our Epilepsiome update on what you need to know about SCN1A, our reply to our readers’ questions on SCN1A, and our post on the three twists in the SCN1A story that you didn’t know about. 2 – SCN2A. In our initial blog post, we called SCN2A “the genetic shape-shifter”, a gene that is associated with a various epilepsy phenotypes and which is notoriously hard to interpret from gene panel analysis. For every patient diagnosed with SCN2A in 2015, we un-diagnosed a patient given that the alleged causative SCN2A variant was found to be a rare population variant found in ExAC. Nevertheless, SCN2A encephalopathy is one of the most frequent epileptic encephalopathies and there is increasing knowledge about the specific SCN2A phenotypes. 3 – SCN8A. SCN8A is the third of the common genetic sodium channelopathies and it may be more common than is usually assumed. SCN8A has been found to be associated with a range of epilepsy phenotypes. Even though it had been assumed that that SCN8A is primarily associated with more severe phenotypes, a recent publication suggests that a recurrent variant can also be found in benign familial infantile seizures. 4 – DNM1. At the Annual Meeting of the American Epilepsy Society (AES) in Philadelphia, we presented our first analysis of the phenotypes of patients with DNM1 encephalopathy, which suggests that up to 30% of patients with DNM1 encephalopathy carry a recurrent mutation with a predicted dominant negative effect on Dynamin function. Given the additional patients that we became aware of in the interim, DNM1 encephalopathy seems to be one of the more common genetic epileptic encephalopathies. Please let us know if you are aware of additional patients who may be included in our upcoming case series. 5 – GRIN2A. Mutations in the gene for the NR2A subunit of the NMDA receptor are associated with epilepsy aphasia syndromes. In 2015, we published a post on a publication on the GRIN2A and speech dyspraxia and dysarthria, suggesting that there is a specific phenotypic spectrum associated with GRIN2A that is emerging. 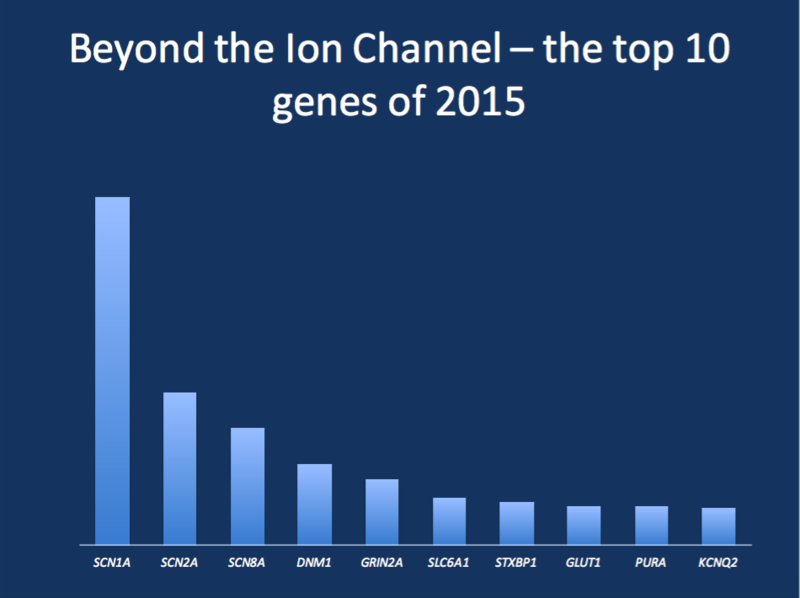 The top 10 genes on Beyond the Ion Channel in 2015. The top 10 list on our blog as per visits to blog posts on a certain gene is both confirmatory and surprising. The three big sodium channel genes SCN1A, SCN2A, and SCN8A are the most prominent genes in 2015. A small surprise is the high rank for DNM1 and SLC6A1. Furthermore, the fact that PURA ranked amongst the top 10 genes is a complete surprise. This may be reflective of the fact that this gene may be more common than expected. 6 – SLC6A1. In 2015, we published a post on SLC6A1 as one of the first genes for Myoclonic Astatic Epilepsy (MAE) or Doose Syndrome. The fact that SLC6A1 is amongst our top 10 genes is one of the surprises of this list. One reason that this post received that much attention was the fact that there is an ongoing interest in the genetics of MAE, one of the genetic epileptic encephalopathies that is still poorly understood. 7 – STXBP1. The STXBP1 gene has also emerged as one of the most common causes of genetic epilepsies and likely the most frequent disorder of synaptic function. The phenotypic spectrum and the dynamic development of the epilepsy in patients with STXBP1 encephalopathy is only becoming clear. At CHOP, we are currently in the process of building a registry of patients with STXBP1 encephalopathy to better understand the natural history of this condition. 8 – SLC2A1/GLUT1. We reviewed SLC2A1 as of one our Epilepsiome genes in 2015. Initially discovered as a gene for a severe neonatal disorder, the SLC2A1 spectrum has been found to include Early Onset Absence Epilepsy and therapy-refractory generalized epilepsy. The diagnosis of GLUT1 deficiency is important, as the ketogenic diet is a causal therapy for impairment of glucose transport across the blood-brain-barrier. 9 – PURA. We only published a single blog post on the PURA gene, which I had considered a very rare genetic disease mainly associated with intellectual disability. However, starting in late summer, there was a spike of interesting in the PURA gene, which I found intriguing. It may be that PURA is actually a gene that is chronically underreported and that this gene is more common than we would assume. 10 – KCNQ2. There was actually less interest in the KCNQ2 gene than we would have expected on our blog, a gene that may be the most common genetic cause of neonatal epileptic encephalopathies. I believe that this is actually a good thing as the KCNQ2 community is already very active. In many ways, KCNQ2 is one of our model genetic diseases, with a tightly connected group of researchers, clinicians, and patient organization. We hope that we can spin this energy into novel approaches for precision medicine soon. A Happy 2016 to everybody and we are looking forward to seeing you back on the Channelopathist website in the near future. This entry was posted in 2015 and tagged 2015 summary. Bookmark the permalink.